Lately I feel like Life Off the D list has been put on the back burner, and honestly it has. I know I keep saying this but this semester at school is so crazy with this anatomy class I’m taking. It’s not just about the blog itself though, it feels like my entire healthiness journey has been put on the back burner. What’s that you say, “But aren't you taking a swimming class?”, why yes indeed I am. That swimming class is the one thing that is saving me right now. Without it there would have been no healthy anything all the month of September. September was a rough month for me. I was getting back in the swing of things and adjusting to my new schedule. I am busier now that I have been the past few semesters which doesn't leave much time for anything else. This is exactly the reason I took the swimming class, I saw this possibility coming. While school is my number one priority, besides my daughter, my health runs a close second. September brought on some old habits that I thought were gone for good. September reminded me that this is work and it is forever, there are no quick fixes. It’s so easy when life gets crazy or throws us a curve ball to just let our priorities shift and put things on the back burner. Especially the things we may not always want to do like go to the gym or fix something healthy to eat instead of something quick and easy(and usually supper duper bad for you). These are precisely the times when we need to maintain our focus on our goals. Admittedly, most of my healthiness journey goals went right out the window this past month or so. All that is changing though and its time to get this show back on the road! 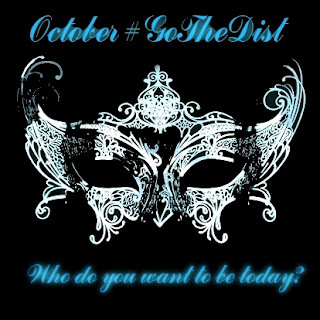 This blog, #gothedist and people like the Fat to Fit Pack (#f2fpack) are my accountability. I am holding myself accountable again with these and I challenge each of you to find some way or person to hold yourself accountable for October. Set goals, phone a friend, write it on your calendar; Do SOMETHING to hold yourself accountable and meet your goals. What are your goals for October, have you set any goals??? I got swallowed by September and am battling back myself. Woo to the hoo, right? WhooHOO is right! We got this!